There are many endangered animals in the world. The penguin is one of those animals. I like the penguin because it’s very cute, comical and beautiful. 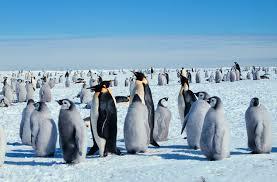 The Emperor penguin is a variety of penguin that lives in the Antarctic. It breeds in the inland of Antarctica. A penguin couple cooperates with their mate in child raising. One of them sits on the eggs, while the other goes to the sea and gathers food. The sea is far from their colony. It has to walk a long time. However, Global warming effects their life in recently years. The land mass around the colony has changed as huge icebergs are melting. Penguins need more time to go to the sea. Some of them couldn’t return to the colony. Of course, I know that global warming is a result of human activity. Not only penguins, but many animals are in danger of extinction from global warming. I think that we have to change our life so that it doesn’t have a bad influence on animals. This was a good example to use in your essay. The habitats of many wild life species are in danger. The ‘rock hopper’ penguin found near the Cape Horn of South America and in New Zealand has dropped in numbers by 25% in the last 30 years. Other endangered animals include the giant tortoise, tigers, rhinos, gorillas, leopards, elephants, dolphins, whales, monarch butterfly, Arctic wolf etc. I hope that not only these species of animal can be protected and survive but also the variety of plants that are necessary for our existence.